This is, I think, the best Coffee infographic I’ve ever seen. And I have seen many. Is following the coffee industry like following sport? I follow the ins and outs of the coffee industry – especially in Queensland – pretty closely (so congrats to the team at Dandelion and Driftwood for taking out every podium spot at the Queensland Barista Championships last weekend), I found this little piece from Jason Kottke pretty interesting. I think you could take the analogy to different places based on familiarity with what you’re talking about (Kottke is a self-confessed non-coffee drinker). Specialty Coffee is like the Champions League, pod coffee is like the hackers league I play in on a Saturday. On Monday morning we were confronted with a major dilemma. Something akin to that moment in the operating theatre of a TV medical drama where the surgeon needs a solution, and he or she needs it stat. We needed breakfast and coffee. Bean supplies at home had dwindled to catastrophically low levels. And it was suddenly time to cut to a commercial break. Having Mondays as a day off is less than ideal when it comes to the specialty coffee scene in Brisbane – lots of cafes offering great breakfasts aren’t open on a Monday – which I can totally understand given that a) I too have Mondays off because I do the most important part of my job on a Sunday, and b) it is Monday. Sourced is about as hipster as it gets in Brisbane, a providore of fine locavore styled fruit and veg, a grocer/deli for the gourmand, a breakfast spot and, perhaps most importantly, a Cup Coffee account. It’s a fun and lively place, with fun and lively foodstuffs to savour. The coffee was good, if, perhaps, lacking in the ‘body’ my coffeepanions prefer in their drinks (a flat white, and a piccolo). I had no complaints about mine – I love Cup’s roast profile, and it’s always (in my humble opinion) going to bring out the more exquisite and delicate flavours, at the expense of some of the thick, gooey, body and viscosity that you might get from a darker, oilier, roast. I enjoyed my flat white. I enjoyed my smashed avo. I desired many other items both from the menu and the shelves. I will go back. One Monday. From the team of geniuses (Oxford says that’s the official plural) who brought you Bunker, comes another spectacular reclaimed space turned specialty coffee hotspot. Seriously. I believe these guys could turn anything, anywhere, into a cosy place for delivering stellar coffee experiences. And within a few weeks they’ll be offering up boutique beers as well. So you’ll never have to leave. The name John Mills Himself comes from the building – apparently formerly a little stationery nook proprietored by John Mills, himself. The tile mosaic that greets you at the door of this space (down a hill, behind some buildings on Elizabeth St) is a beautiful homage to the store’s roots. The exposed brick interior makes this a particularly comfortable bolthole, especially when the visual vibe is complemented by a beautiful old school bar with touches of marble, and there’s a piano. It’s a great space – and if early indications are anything to go by, once word truly gets out, these guys are going to be kept pretty busy. I’d just been to Strauss, so didn’t have my standard flat white. And even if I had, I wouldn’t want to talk about it. The coffees at JMH are supplied by three of my absolute favourite roasters – Cup, Uncle Joe’s, and The Single Guys – Marcus from Bunker/JMH spent a fair bit of time trying to figure out how to both minimise drink miles and recognise the incredible standard of coffee roasting in Brisbane, when I spoke to him a while back he was trying to narrow down his choice, but I think the rotating approach, for a non-roaster, is both spectacularly generous to other parties in the Brisbane scene and a win for punters. I have no doubt that had I enjoyed a traditional espresso based drink John Mills Himself would have well acquitted the task. But I want to talk about something else. The best filter coffee I’ve ever had. This, believe it or not, is a revolution. It was poured using the espresso machine. And why not? It is a multi-thousand dollar water heater. This approach was pioneered by St Ali’s Matt Perger at the World Barista Championships last year (video), and while Marcus took his lead from Matt’s approach, the finer details are of his own making. And the man has a palate. If you’re not a coffee geek – you just need to know that this particular coffee, using an Ethiopian Yirgacheffe roasted by Uncle Joe’s, was delicate, sweet, fruity, and exceptionally well balanced. 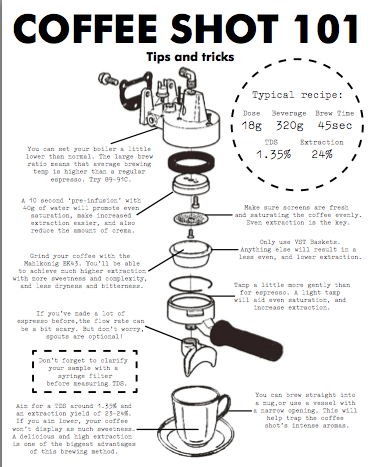 If you are a coffee geek – or are aspiring to be – you need to know a little bit about brew ratios and stuff. Here’s how Matt Perger explains his approach to the “Coffee Shot” in PDF form. Unlike Matt’s approach – which involved running the beans through a Mahlkonig EK-43 – a grinder not traditionally used for espresso production in a cafe setting (read more about the EK-43 from James Hoffman, a former World Barista Champion – Marcus is using a stock standard Mazzer Robur. Which he believes delivers a better flavour. Extraction (Also known as “solubles yield”) – what percentage (by weight) of the grounds are dissolved in the water. Strength (Also known as “solubles concentration”) – how concentrated or watery the coffee is. Brew ratio – The ratio of coffee grounds (mass, in grams ) to water (volume, in litres): how much coffee is used for a given quantity of water. At the WBC, Matt Perger filtered his Coffee Shots through filter paper – JMH is doing this too. But they’ve adopted a slightly different approach. According to Marcus (if I heard correctly) their extraction ratio, from 19 grams of coffee, is closer to conventional (19%), but they are diluting the shots, with water, to achieve 7 grams per 100 mL (7%). I jotted this down on my phone’s notepad app after listening to Marcus – so I may have some of the figures slightly wrong. All you need to know is that these guys are serious about their coffee, in a seriously cool place. And that should be enough for you to check them out. From the coffee artists who brought you Cup, and Merriweather, comes Strauss – a beautifully realised and aesthetically delightful alley cafe on Elizabeth Street in Brisbane’s CBD. Where Cup (now sold), and the Cup Roastery (still roasting deliciousness), have nailed the hipster vibe, Strauss picks up its cues from Merriweather, offering something charming, polished, and professional. Did I mention it’s in an alley. Coffee is all about precision – and nobody gets that like Josh from Cup, and the members of the Cup family who are now branching out. Strauss is a labour of love and precision. Everything – from layout, to fitout, to output – benefits from this recipe. Even the ceiling speaks of an eye to detail and a passion for quality. I had the Rwandan Cyebumba as a flat white and an espresso. My flat white was good, but a touch on the hot side, and it was, as I was rightly warned, better without the milk. The shot was like a citrus punch to the face. In a good way. Orangey. My wife had a piccolo on the house blend – which she said was stunning. Strauss serves a fairly limited but tasty looking brunch menu and is arguably the reason that Brisbane is now the coolest city in Australia (allegedly). Well. Not single handedly. It’s definitely worth tracking down – and all of a sudden there are a handful of coffee options that I can recommend to people in Brisbane’s CBD. Look. I’ll get back on the reviewing wagon soon – we’ve just had kid let number 2. This coffee documentary from yesteryear is quite nice. Check out some vintage print ads from around the same period. The Cup empire is expanding. Coffee lovers rejoice. Merriweather (also on Facebook) is the lovingly and carefully conceived offspring of the Cup team – it’s even on the same street as the mother ship. It boasts the same incredible attention to aesthetics. The same simple fare with a slightly decadent touch, and the same approach to the bean. Near perfection. This was my French Fruit toast with poached quince and Mascarpone. From memory (my visit to Merriweather was a couple of weeks ago – the review has been delayed somewhat by the arrival of my baby boy). It was delicious. The coffee menu is, as one would expect from Cup, spectacular – featuring a special house blend, a single origin, and the expertise of some fine baristas behind the stunning Kees Van der Western Spirit – there’s also pourover if that’s your cup of coffee. I described this flat white as “brown sugar in a cup” – sadly, thanks once again to my failing memory – I can’t remember where it was from. But I can remember the taste like it was yesterday. Merriweather is set up in the ground floor of the brand new Vine building on the corner of Russell and Merrivale. Josh – the brains, hands, and creativity behind Cup is a candidate for some sort of cafe edition of The Block – the fit out is his craftsmanship. It is simply stunning. Clean. Simple. Elegant. The attention to detail extends to the coffees – or perhaps from the coffees outwards. Long may they reign. The Brisbane cafe scene could be a bit of a dog fight if it wasn’t full of such nice people – so the Red Baron is appropriately named. It’s a customised, kitted out, shipping container in the car park of an office building in Milton. The team serve up Veneziano’s beans with a degree of finess. I like Veneziano cafes at the not quite best of times – but the Red Baron is up there with the mother ship in terms of quality. They’ve got a tasty selection of food (we had a muffin). And a bit of a sense of humour to boot. The staff (I assume the guys driving the machine while I was there were the owners – from what I gather from a bit of online detective work, they’re brothers) are very friendly and up for a chat. Snoopy would be well and truly at home in this little high flier.